With 3D films becoming a normal occurrence at the cinema, and 3D TV adverts all over the place, now seems like a good time to explain how 3D TV works! There are two types of 3D filming: one based on filters, using the red/green glasses that used to be handed out in cinemas; and then there’s the newer version, which uses polarisation. But both work on the same basic idea: filming the same scene from two slightly different angles in order to fool your brain’s depth perception. Normally, when you’re looking at the world around you, you can see the same object with both eyes. The difference in the distance of the object from each eye allows your brain to calculate how far away it is, through triangulation (which, as the name suggests, does unfortunately involve some trigonometry…). 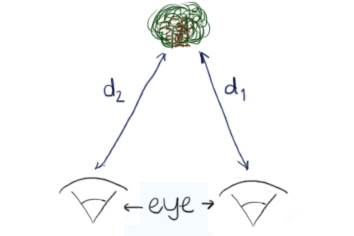 The distance of the tree from each eye, left and right, allows the tree’s position to be calculated and creates depth perception. 3D television mimics this by using two cameras. The further away an object is, the less important the difference between the images each eye sees is, and vice versa: using this, the brain can then calculate how far away an object is. 3D television mimics this using two cameras, one for each ‘eye’, and making sure that each of the viewers’ eyes only sees one of the images – blocking the other using either red/green filters, or polarisation. When you look at any white light (the Sun, a bedside lamp…) through a coloured, translucent object (such as red plastic) you see the object as if it was only emitting red light. This is because a coloured, translucent object actually absorbs all the colours it isn’t (blue, green, purple) and lets through (and reflects) the colours it is (red). Coloured and opaque objects do something similar: they reflect the colours they are, and absorb the colours they’re not. Imagine that there are two different images: one’s green, and the other’s red. If you put a piece of red glass in between you and the green image, it will look a brown/black colour, as it’s not producing any red light – it’ll be blocked. 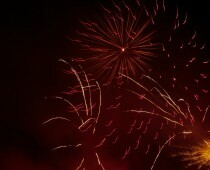 But if you look at the red image with the red filter, you’ll see the image as it originally was. That’s how red/green filters work: one eye only sees a red image, the other only a green image, and combined it looks like you’re seeing two different images at two slightly different angles. Your brain interprets this as depth, and so the images look 3D. The idea’s the same for polarisation, only this time, the light isn’t red and green: it’s polarised in two different directions. Polarisation means that the light wave is only moving in one direction other than moving forward: for example, up and down, or left to right. Normal light, which isn’t polarised, has waves moving in all possible directions. 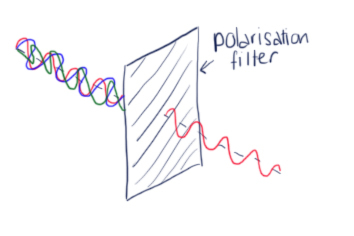 The polarisation filter blocks out all the waves except the ones moving in a certain direction, e.g. up and down. Polarisation filters can block out most of the light, only letting through the light that’s moving in a particular direction. Each lens of the 3D glasses is a polarisation filter: one blocks out everything except up/down light, the other everything except left/right light, and each of the two slightly separate images on the screen is polarised differently, in a similar way to the red/green images. And that’s how 3D TV can trick the brain into thinking a 2D image is 3D! Update: The light from 3D televisions is actually circularly polarised (thanks Michael! ): the essential explanation is still the same, only the light is polarised in circles rather than up/down and left/right. Sounds strange, and definitely tricky to explain, but true! Pippa, I am pretty they use circularly polarised light for 3D cinema and TV – almost impossible to explain or draw to a non-specialist – but that is reality for you. How can one tell? Well, if you have the glasses – put them on and look into a mirror. Now wink. What you see can only be explained if the filters are circularly polarised rather than linearly polarised. Happy to explain at another time.